In these tumultuous days of sectarian violence and the tragic murder of journalists, a story about a journalist’s oppression and ultimate release is more than welcome. In 2009 Newsweek journalist Maziar Bahari was in Iran to cover the controversial elections. Iranian-Canadian himself, Bahari was a bridge between local and international media. During his coverage of the election he had the fortune (and ultimately misfortune), of being interviewed for The Daily Show with Jon Stewart. In a semi-scripted and satirical segment Bahari was filmed speaking with comedian Jason Jones, who jokingly identified himself as a spy. The joke was unfortunately lost on Iran’s conservative regime and Bahari was imprisoned. Rosewater (named for the holy scent of Bahari’s chief interrogator) is based on Bahari’s memoir novel Then They Came For Me. After capturing governmental violence against protestors on film, and with his Daily Show appearance used as evidence of a background in espionage, Bahari was imprisoned in Iran for more than 100 days. What follows is his internal exploration of morals and self-preservation as he lives out his confinement. I was drawn to this film by the subject matter and as a fan of Stewart’s body of work. I was excited to see his first directorial work. And I can safely say it was “pretty good”. I had to mull it over for a few days to figure out why Rosewater didn’t engage me as much as I was expecting, and ultimately I think it was because I never felt connected enough to Bahari’s fear. That may sound strange, but I assure you it’s not a voyeuristic feeling. Maziar Bahari lived through his ordeal and is an activist to this day, meaning that the drama of the film came not from whether or not he’d live, but from how he lived through it. 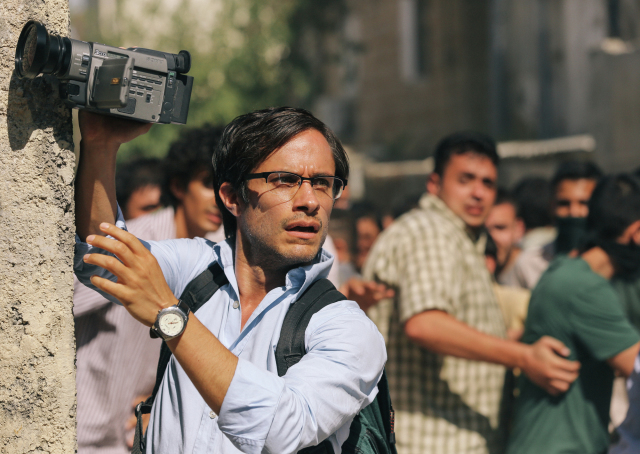 Gael Garcia Bernal was a great choice to play the lead, managing to balance both the humor and gravitas of Bahari’s imprisonment, but ultimately I felt that the levity outweighed any sense of tension. Other than tone however the film was a very competent portrayal of events, and was very well cast. Kim Bodina was wonderful as the interegator “Rosewater”, and I was delighted to see Shohreh Aghdashloo playing Bahari’s mother in the film – I think she is an amazing performer, and can’t get enough of her. The Q&A is the main reason I chose to pay the Premium price for this show, and it was even better than I expected when Maziar Bahari himself joined Stewart and Garcia Bernal on stage to address the crowd. 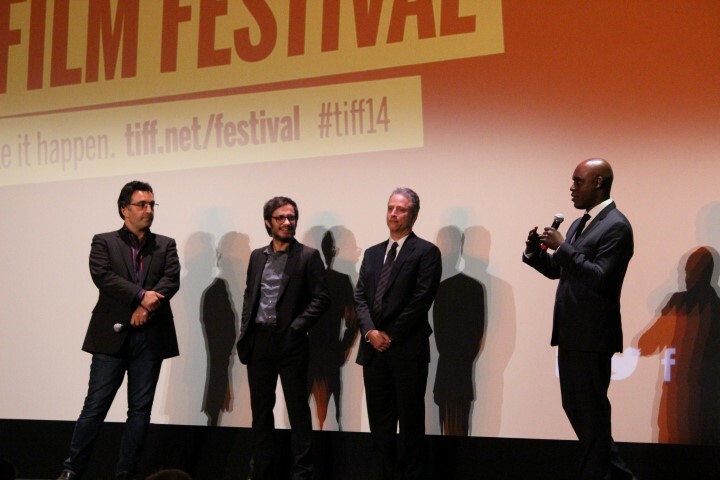 He’d come out briefly before the screening to greet the crowd, and then was ready to answer questions afterward. A young man in the balcony bravely stood asked what today’s youth can do help in these times of strife. The answer is of course not clear cut, but Bahari himself said that speaking up and staying active is the best way to ensure that the spread of tyranny is slowed. While it was not directly addressed in the Q&A, it can be safely assumed that Stewart’s involvement in the project is a result of the part his show played in Bahari’s confinement. It is a truly fortunate thing that Stewart has the industry clout to helm his first picture in support of such an important cause.